Seized property being converted under color of law leaves animals in poor health or dead can not be tolerated. There are very specific laws pertaining to seized property-the animals; both state of Ohio and federal laws would apply to any animals taken by the state, housed in an unsuitable and sub-standard facility and then brokered out to other facilities out of state including animals waiting for court decisions concerning ownership. Considering that the two remaining alive cubs were then transported to the Columbus Zoo after two died; they have been effectively been converted for the zoos usage which can not be tolerated or considered an acceptable practice. I can not help but wonder if Jack Hanna is making plans for using those cubs for his special appearances that he is paid for including; his TV shows, TV appearances as well as private engagements…’Conversion of Property’ under ‘Color of Law’ before court date in August-All eyes on the Columbus Zoo and Jack Hanna!!! 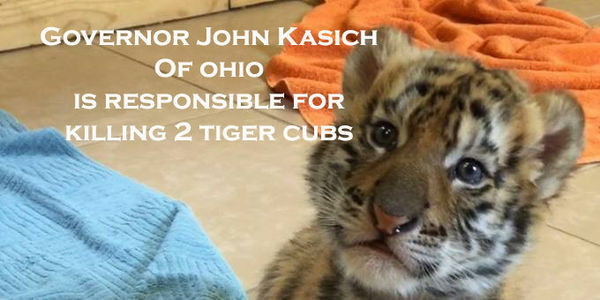 Governor John Kasich of Ohio has now killed 3 endangered species 2 tiger cubs and one male lion named Leo. He has also sent many more to be killed in exchange for tax payer money. Governor John Kasich has teamed up with some of his friends out of the State Of Ohio and sending in swat teams to take animals away from zoos, sanctuaries and private homes that are even licensed by the USDA (Untied States Department of Agriculture) but only exempted his little team of friends. He should be arrested for laundering exotic and endangered animals which violates the Endangered Species Act of compensating his friends with tax payers money to the tune of 6.4 million dollars. Some of his friends have received over $250,000.00 to take them to their private homes out of State. He is responsible for killing two endangered tiger cubs and one adult male lion named Leo. We do not have to put up with crooked politicians using tax payer money for self gain or for an agenda that is laundering money to his buddies. The question you should be asking is- Does the man have that much power to keep the news media at bay? No news media will confront this man. I want to confront this man. What do you think he would do as President of this country if he is stealing from the tax payers of Ohio for just animals? TAKE ACTION NOW -SIGN THE PETITION AND SHARE…!!! ~ by topcatsroar on May 24, 2016.